This bug has been reported many times since at least 2013; it’s astonishing that Google has not fixed it. Victims of this problem which prevents the Chrome browser from auto-updating do not have the latest security updates, leaving them vulnerable to malware and hackers. Plus, they are missing out on the latest Chrome features. Chrome updates happen automatically, in the background, so it’s not uncommon for them to go unnoticed by users. The only indication that something is amiss with an update is a change in the "More" icon near the upper-right corner of the browser window, that gives access to Chrome’s settings. Normally it appears as three vertical dots, but if it appears as a colored circle (gray, red, orange or green) that indicates an update problem. After clicking the icon, the words “Relaunch Chrome” or “Update Google Chrome" will appear at the top of the dropdown menu when an update is incomplete. Clicking Help-About shows another relaunch prompt. Close all open Chrome windows. Open Windows Task Manager (press Ctrl-Shift-Esc), click the Processes tab, and end any chrome.exe tasks that are still running in background. Close Task Manager. You will see two application files: chrome.exe and new_chrome.exe. Delete chrome.exe and then rename new_chrome.exe to chrome.exe. Chrome should now be up to date. You can verify this by launching Chrome, clicking that "More" icon, and selecting Help, then About. The Chrome installer is supposed to download the latest version to the file new-chrome.exe, rename chrome.exe to old_chrome.exe, rename new_chrome.exe to chrome.exe, and then delete old_chrome.exe when chrome.exe (the new one) is launched. Did you follow that progression? For some reason, new_chrome.exe is not getting renamed to chrome.exe. So launching Chrome just starts the old version, leading to the endless loop of “relaunch to complete update” prompts. The most likely reason for this renaming failure is that the old version of chrome.exe is still in use by the system, so its file cannot be deleted and new_chrome.exe cannot be renamed to chrome.exe. Chrome is notorious for launching multiple instances of itself, chewing up lots of RAM memory. This renaming bug could be due to an instance of chrome.exe that was not closed properly. In any case, the procedure described above worked for me and other Chrome users. I have not seen the relaunch loop since; but then, I have not received another update yet. If you have a problem with the Chrome browser not being updated automatically, give this a try. 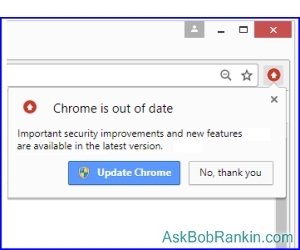 Most recent comments on "[HOWTO] Fix the Chrome Update Bug"
Bob! Do you rely on a spell checker to vet your typing? My problem is twofold the recent part is more than likely something I did messing with settings because my banking websites wont let me use bill pay (the older problem that happened when the bank updated it's website many months ago), insisting I don't allow cookies. I do, just not 3rd party cookies and have whitelisted the banking site everywhere I can find to do so- Chrome, Kaspersky and Antiminer. Now every time I start my browser I have to log into Gmail. Not a big deal except that I enabled two-factor ID and have to go get my iPhone, usually charging this time of the morning. the first thing i do with chrome, when i realize i have it, is delete it again!!! I hope that I can find this one quickly should I ever decide to install Chrome. (I keep all of Bob's emails.) I suppose that a Chrome bug is way better then a Bronze beetle. Or an Iron Butterfly. I'm really starting to resent having to fix "bugs" in software that shouldn't even happen. I realize that Chrome is "free" though fully paid for by the data mining and the loss of our identity to Google, but the error after error shoved onto us by incompetent programmers is reaching epic proportions. Keep laying off our US programmers in favor of barely out of school H1b's.It's a sad day when I call a CS number to find out I know more than they do. What are others problems with Chrome, just curious, with citations please. Also, not seeing a new_chrome.exe file? I am not a techie, but I'd like to know if it would be too much of a leap of faith to assume Google has corrected this problem if there is no application file labeled as either new-chrome.exe or new_chrome.exe in the Google Application folder? I also note there are Beta-(2018-10-25), Dev-(2018-10-25) and Canary-(2018-12-01) releases subsequent to the version now resident on my laptop. Bob- having tried (after reading your post) Vivaldi, I'd never go back. Vivaldi's faster, just as flexible, and detached from the Big Brother that Google has become. Chrome failing to update should be a problem to no-one. Thanks for the Vivaldi tip though!